In Norway, the Atlantic salmon aquaculture industry has an annual haul of 1.1 million tonnes valued at more than US $7-billion. But fish faming in Norway and elsewhere is undermined by salmon lice. These parasitic crustaceans feed on the skin, blood, and tissues of finfish. In aquaculture sea pens, where their preferred hosts are housed by the thousands, salmon lice run rampant. As they eat their way through the protective mucus layer on their host’s skin, lice leave the salmon vulnerable to disease. With enough skin damage, the situation becomes more acutely lethal. “The fish aren’t able to osmoregulate,” says Kjell Maroni, the director of research and development for aquaculture at the Norwegian Seafood Research Fund, who worked on the new study. 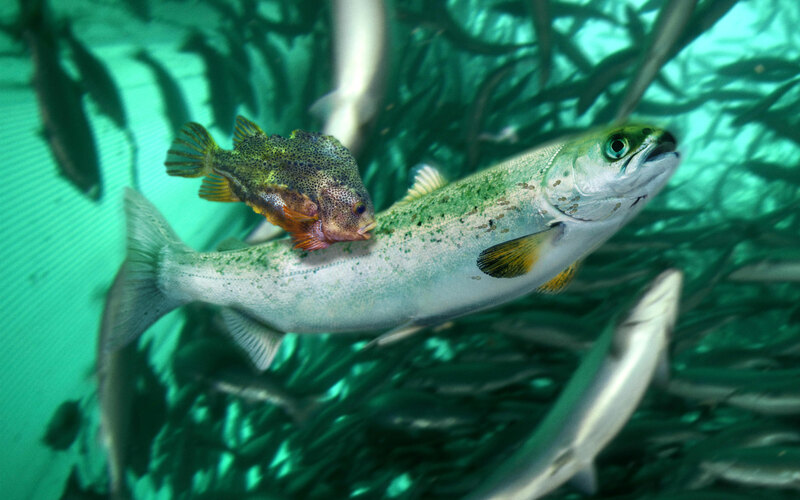 A heavily infected salmon will start to lose water to the mineral-rich ocean around it, upsetting its internal water-salt balance. Essentially, it gets pickled by its salty home. Lice infestations are a global problem. In North America, salmon lice are among the biggest limiting factors to an increase in salmon aquaculture. “Some sites are so bad that farmers have to leave the sites fallow for a few years,” says Brian Peterson, an aquaculture specialist at the US Department of Agriculture’s National Cold Water Marine Aquaculture Center in Maine, who was not involved in the study. Traditional methods to control lice include bathing the fish in hydrogen peroxide, feeding them food with additives aimed at preventing lice from attaching, pressure washing the lice away, and using powerful pesticides. Tamer treatments show varying levels of success, while the harshest options can stunt the salmon’s appetite and growth. What’s more, most of the treatments are losing effectiveness. “No one likes to use chemicals to control sea lice,” says Peterson. “Sea lice build up resistance and the process of treating the fish is very stressful. 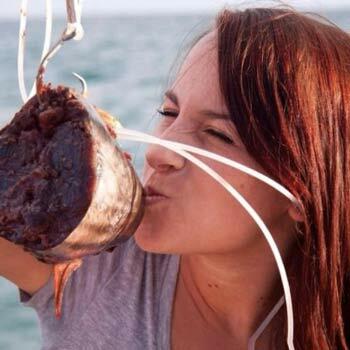 Lumpfish provide an alternative to chemicals and it is a welcome relief,” he says. In Norway, the increasing use of lumpfish to control salmon lice has propelled production of the tiny parasite-eater, and similar cleaner fish programs are taking off elsewhere. To meet the needs of this growing industry, an estimated 50 million lumpfish will have to be deployed annually, and Maroni’s anesthetic research could help keep them alive. Beyond ethical concerns, keeping stress deaths down is increasingly important economically. But anesthetizing a fish that weighs less than a peanut takes careful planning. Everything from tolerance, to withdrawal time, to potential safety concerns for humans has to be evaluated on a species-by-species basis, notes Maroni. “We’re thinking about all of this when selecting from the big variety of available chemicals,” he says. A sedative popular among aquarists called Aqui-S, for example, proved to be overly potent for young lumpfish. Two other anesthetics tested, on the other hand, showed no lasting effects on the fish. The fact that this research is necessary is a demonstration of just how complicated the road to our plates can be. Here are the drugs that calm the fish that eat the lice that eat the fish that live in the pens in Norway. But as the environmental impacts of aquaculture come under increasing scrutiny, many researchers feel using fish that clean is the simple choice. And as the aquaculture industry moves ahead, at least more of these parasite-fighting conscripts will survive the drive. Sarah Keartes is a science and wildlife journalist based in the Pacific Northwest. When she’s not serving up stories for PBS Digital Studios, Earth Touch News, Popular Science, and elsewhere, she can be found climbing mountains with a board on her back. Cite this Article: Sarah Keartes “Parasite-Eating Lumpfish Are Being Put to Work, but First They Need to Be Kept Alive,” Hakai Magazine, Apr 11, 2019, accessed April 23rd, 2019, https://www.hakaimagazine.com/news/parasite-eating-lumpfish-are-being-put-to-work-but-first-they-need-to-be-kept-alive/. On fish farms, sea lice chew through the protective effect of vaccination.